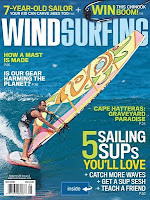 Bill's OBX Beach Life: Hatteras Feature in May Issue Windsurfing Mag! April is here, SW Bermuda High-like conditions are locked in place, and the water is warming nicely both in the sound and ocean! What better place to be than Hatteras! If you are here this week, you are scoring some excellent warm, windy conditions, and if you are planning a trip later this month or this Spring, it will only get better!! In print publication news, the May issue of Windsurfing Magazine features an excellent Hatteras piece written by Stewart Proctor. It highlights the intensity of sailing Hatteras and includes some awesome dramatic images by Lane Dupont, as well as first time print published windsurfing photographer, Sam McAdoo! Be sure to stop by your local Borders to pick it up if they hopefully have it, or you can see it online (save your three zoom pages for the Hatteras feature)! Stay tuned for reports this week! SSW is locked in, and there is a little swell out there! I am looking forward to some after work sunset sessions at that little wave playground located about 1/2 mile north of the Oregon Inlet access ramp. Who wants to join me for a few waves?! Rats, my copy hasn't arrived yet, and I'm leaving for Hatteras. Well I'll just have to accept reality over the written word till I get home.